The duo will perform works by Desportes, Ibert, Pujol, Faure, Krouse and Merlin. Free Will Offering. MICHAEL SIMMONS studied with John Leonard and Peter Segal and has performed in master classes for Benjamin Verdery, Sharon Isbin, Eliot Fisk, Carlos Barbosa-Lima and Oscar Ghiglia. He was the winner of the 1993 Philadelphia Classical Guitar Society Competition and a finalist at the 1995 National Guitar Summer Workshop Concerto Competition. As a member of the Philadelphia Classical Guitar Trio, Mr. Simmons has performed nationally and internationally, including the 1999 Festival Internacional de Guitarra de Puerto Rico and for the Third Encuentro Internacional de Guitarra Panamá 1999. Mr. Simmons is an active solo and ensemble guitarist and performs regularly with flautist Thomas Meany and vocalist Lizette Casals. Thomas Meany is a graduate of the Philadelphia College of the Performing Arts, where he studied with Adeline Tomasone and Loren Lind, later studying with Harold Bennett in New York City. Tom is currently a graduate assistant and a candidate for a Masters of Music from Rowan University He has performed at the Aspen Music Festival, Summertrio Chamber Music Festival and the Puccini Opera Orchestra in Italy. Thomas has played master classes with leading flautist such as the late Murray Panitz, Chicago Symphony’s Donald Peck, Samuel Baron at New York University and Toshio Takahashi at the East Tennessee Suzuki Flute Institute. 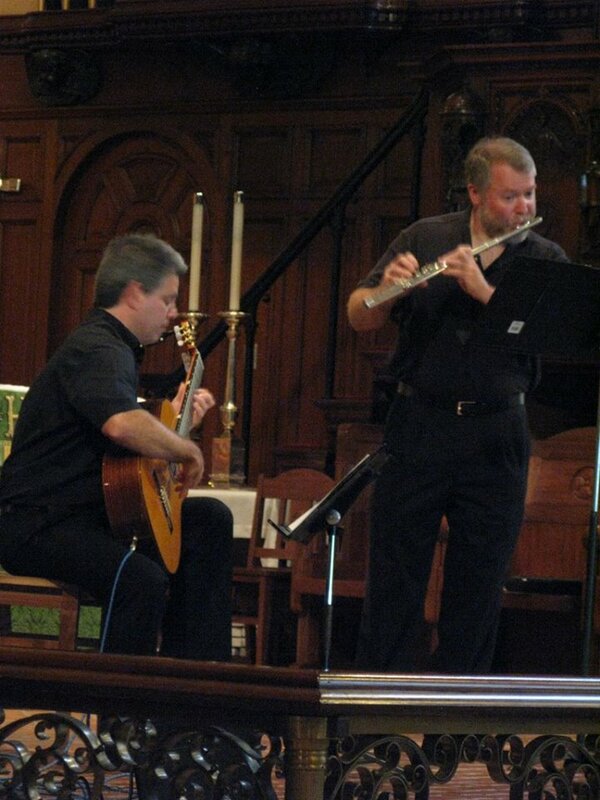 In addition to performing regularly with guitarist Michael Simmons and the Walnut Street Chamber Trio Mr.Meany has performed in recital for the Matinee Music Club, the Philadelphia Cultural Council, the Flute Society of Greater Philadelphia, the Department of Recreation and Pennsylvania Performing Arts on Tour (PennPAT). He has played flute for the Opera Company of Philadelphia, Orchestra Society, the Haddonfield Symphony, and the Lansdowne Symphony. Mr. Meany is a Certified Suzuki Instructor and has recently received three consecutive scholarships from the Suzuki Association of the Americas. He teaches for Instrumental Music Programs and the Settlement Music School. He is the current Vice-President of the Flute Society of Greater Philadelphia. Tom playes a Brannen-Cooper Flute. Follow the Meany/Simmons Duo on Face Book.